What is task dependency and what is it used for? Some tasks need to be completed in a particular order. When the approach to a certain task depends on the result of another, dependency helps associate them together and determine an order to work. 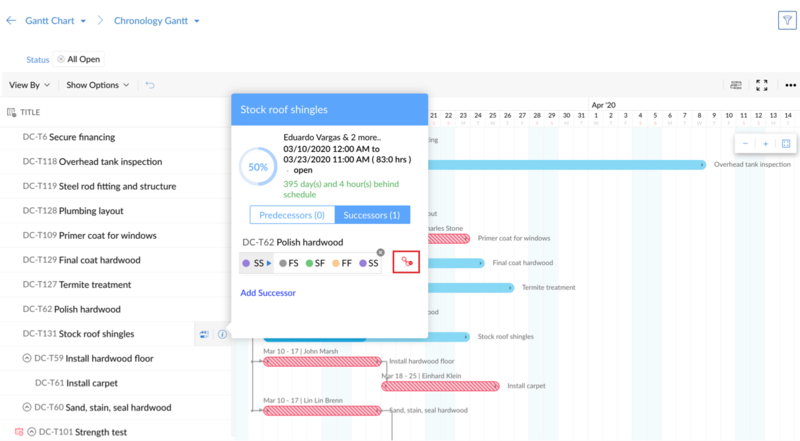 Projects' end-to-end Gantt visualization provides a bird's eye view of your tasks, helping you track them easily. Using the Chronology Gantt chart and the Milestone Gantt chart, you can effortlessly establish dependencies between tasks. Click here to learn more about access privileges for Task dependencies. Zoho Projects supports four types of dependency. Finish-To-Start (FS) : The successor or dependent task can’t begin until the predecessor or parent task is finished. For instance, in a journal publishing process, self-review of a journal can’t begin until the draft is completed by the writer. Start-To-Start (SS) : The successor or dependent task can’t begin until after the predecessor or parent task has started. For instance, as the peer review of the journal starts, the manager review can also be initiated. Finish-To-Finish (FF) : A task (successor/predecessor) can't be completed until the other task is finished. For instance, error correction can't be completed until the manager review is finished. Start-To-Finish (SF) : The successor or dependent task can be completed when the predecessor or parent task is about to begin. For instance, publishing the journal can’t be completed unless the journal binding starts. Open your project and click Reports in the left panel. Select the Gantt Chart section in the main panel. Select Chronology Gantt from the drop down menu. Mouse over a task name or click the Gantt bar corresponding to that task to view a popup. Toggle between the Predecessors tab and the Successors tab, then click Add Predecessor or Add Successor. The Select project drop down will display the name of your current project. Enter the task name you want to link in the text box and select the task from the ensuing drop down. Click Set Dependency to save. Zoho Projects supports four types of task dependencies. The default dependency type is Finish-To-Start (FS). If you want to learn how to change the default dependency type, click here. Use Select project drop down to select the project under which the dependent task is present. Enter the task name you want to link in the text box and select the task from the ensuing drop down. Click and drag a line from the parent task to the target task in the Gantt chart. A dependency has been created. Hold down the 'ALT' key, then drag a line to the target task to view a pop-up where the dependency type and time lag can be modified. Select Chronology Gantt from the drop down menu. The tasks of all open projects are available in a list view. 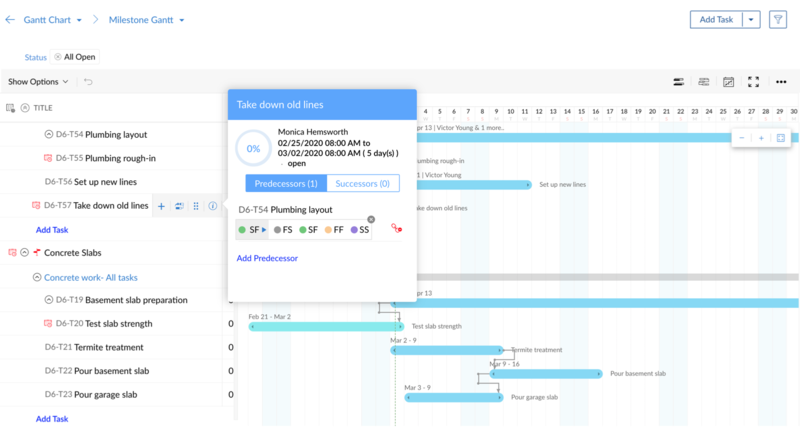 Gantt chart showcases the tasks with start (and/or) end dates in the calendar view. Click to bring the task's corresponding Gantt to view. Also, click the icon and draw a line to the target task to set a new dependency. Dependent tasks from other projects will be greyed out but clickable. Click on the task name to view the task details. Mouse over the task name to view a pop-up. Toggle between the Successor or Predecessor tabs to view the linked tasks. Click near the current dependency type to modify the dependency. Mouse over the task to view a pop-up. In the pop-up, mouse over the linked task name under the Successor or Predecessor tab to find at the right end. Click it to remove dependency between the corresponding tasks. Lag is the time gap between the predecessor and successor tasks. In a construction site, once the task - ‘Roofing’ is completed, a lag period of 20 days(say) is required before the next stage can start. If the lag value is negative, it is known as lead time. In a pizza store, the successor task - ‘Prepare the sauce’ can lead the predecessor task of ‘baking the bread’. So a lead time of 2 hours(say) is set between both the tasks. Mouse over the task name for which time lag or lead needs to be set. A pop-up will appear. Click Set time lag under Successor or Predecessor tab and enter the lag or lead value in hours or days. Select Milestone Gantt from the drop down menu. By default, Chronology Gantt is chosen. Select Milestone Gantt from the drop down menu. Select Milestone Gantt from the drop down menu. The tasks of all open projects are available in a list view. 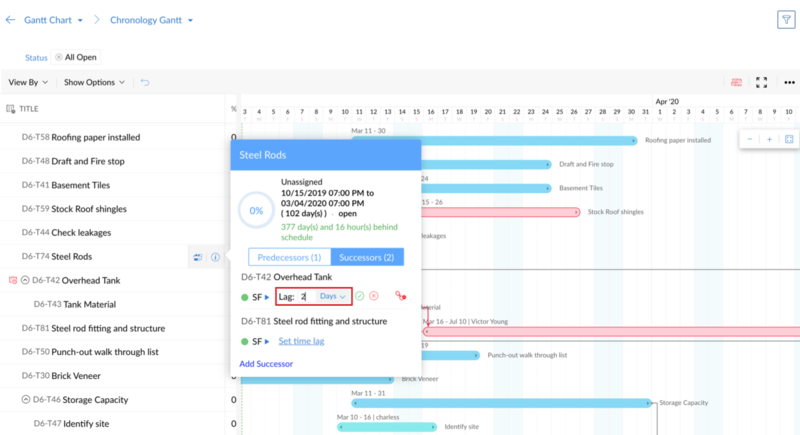 The Gantt is partitioned to showcase the Unscheduled Tasks explicitly while the tasks with start (and/or) end dates are found in the calendar view. Click to add a new task above the respective task or sub task. The new task or sub task inserted is always at the same task level. Click and drag a task between a set of tasks to reorder. Also, drag and place the task over another task to make it a sub task. Mouse over the task name to view a pop-up. Lag is the time gap between the predecessor and successor tasks. If the lag value is negative, it is known as lead time. Learn when to use lead and lag values. Click and select Org Settings under Portal Configuration. 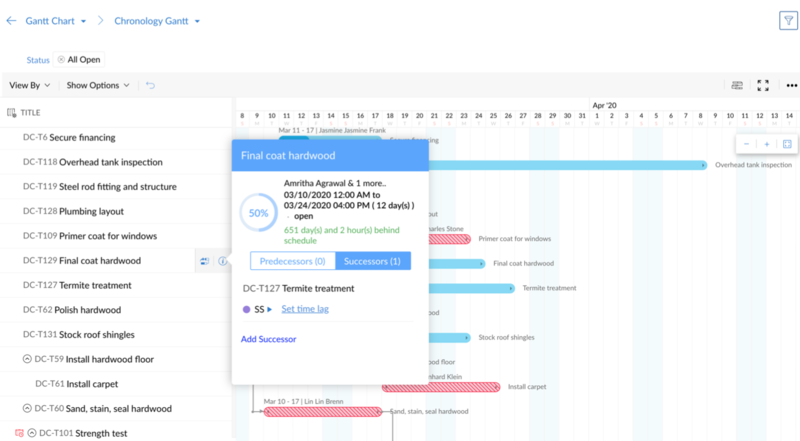 Select Task & Timesheet in the left panel and scroll down to find Task Dependency where custom options for the project can be chosen. You can also navigate to Task Dependency Settings by clicking on the icon in the right corner of the Gantt chart page beside Scroll to Unscheduled Tasks. You can configure the Task Dependency Settings to set the default dependency type. Click and select Org SettingsunderPortal Configuration. 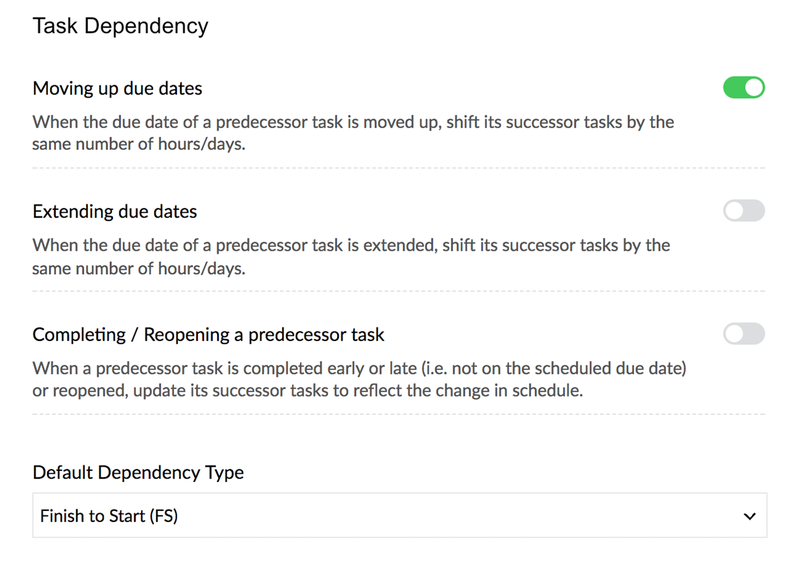 Select Task & Timesheet in the left panel and scroll down to find Task Dependency. Select the Default Dependency Type dropdown menu to choose the type of dependency. When selecting Automatic, the dependency type will be assigned automatically based on the dates specified for the parent and child tasks. Automatic is most useful when you don't want to shift the dates for the child task.